After 25 years in the business, it has become one of the world’s leading manufacturers of conventional and fifth-wheel trailers. With models ranging from 17 to 36 feet, Kodiak travel trailers are light enough to be towed by SUVs, minivans, and light trucks. 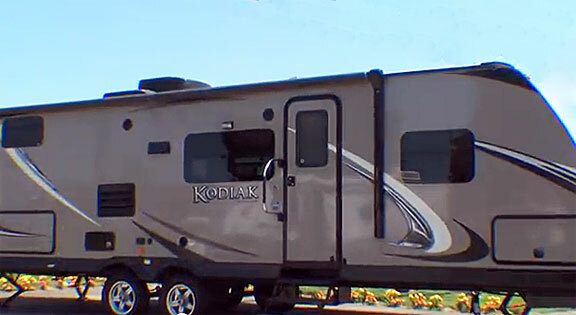 Though there is a variety of different Kodiak models to choose from, standard features include: aluminum rims, diamond plates, enclosed underbelly, tinted safety glass windows, outside speakers, patio light, bedroom roof vent, stabilizer jacks, pull-out burner cook top, TV antenna, bunk mats and radial tires. Kodiak’s interior is fully equipped with nightstands, an oven, a flip sofa, a six-gallon water heater, a stainless steel refrigerator, and driftwood gray-glazed cabinets. One of the larger models, the 2014 Kodiak 298RLSL Ultimate is 36’10” in length and eight feet wide, with a height of eleven feet. Roomy and spacious, it features dual entry doors and a tri-fold sofa along the back wall that can also be used as a double-size bed. There’s also theater seating for two, massive overhead cabinets, and an entertainment center that can be viewed easily from any vantage. The kitchen comes fully loaded with a microwave, refrigerator, three-burner range, and double sink. The master bedroom contains a nightstand and queen-sized bed, while the bathroom includes a 34-inch angled shower, toilet, sink, and medicine cabinet. There’s a corner linen cabinet above the toilet and another linen cabinet located conveniently just across the hall from the bathroom. It’s probably the closest you can get to having a fully furnished house on wheels. The Ultimate sleeps up to five people and is perfect for a romantic weekend getaway. By contrast, the Kodiak 299BHSL Express is more compact. At 34’10 long and 8’0 wide, the entertainment center is placed in the bedroom and the kitchen is located in a smaller room to the left of the entrance. It does feature a microwave, pantry, refrigerator, double sink, and bathroom, though it lacks the theater seating of the 298RLSL Ultimate. A U-shaped dinette and sofa conserve space and allow more room for walking around or hanging out. One of the special features of this model is a rear bunkhouse with a 72-inch sofa slide-out and, directly above it, a 28’x74’ flip bunk. Beside it, there’s a wardrobe and ladder leading up to the top bunk. For those planning a family vacation, the bunkhouse is a great place for the kids to play and hang out. The RV sleeps up to eight people and, like the Ultimate, has a fresh water capacity of 52 gallons.